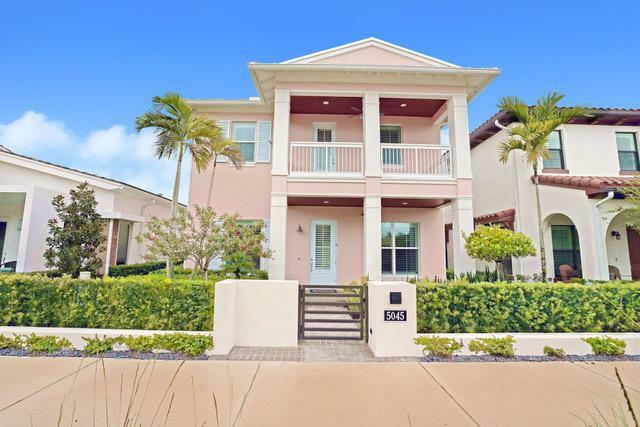 This house represents why ALTON is Palm Beach Gardens' most popular new community! Ideally situated on a premium, exterior-facing lot, with southern exposure and just a short walk from the clubhouse. The upgraded island elevation D-model is complimented by a metal roof, second story balcony, and custom tongue-and-groove exterior wood ceilings. Heavily upgraded from developer standards with features including plantation shutters, custom window treatments, 48'' porcelain tile, stainless steel handrail, 3'' quartz countertops, and upgraded fixtures. The master bedroom is downstairs with a custom built-in closet. Add'l upgrades include marble balcony floor, front entry gate and fully-fenced, synthetic turfed back yard, and natural gas powered whole-house generator.Den can be easily converted to a 4th bedroom/home office/playroom. Low HOA fees include irrigation, lawn care, cable/Internet, and all community amenities.